Ah, peach season. Warm, juicy, ripe fruit dripping with the sweet nectar of summer in Texas. Unfortunately, it’s January, and while winter grapefruit is delicious, it does not belong in a galette. I have also never successfully convinced Stephen that grapefruit is useful for more than just making the sink garbage disposal smell nice. 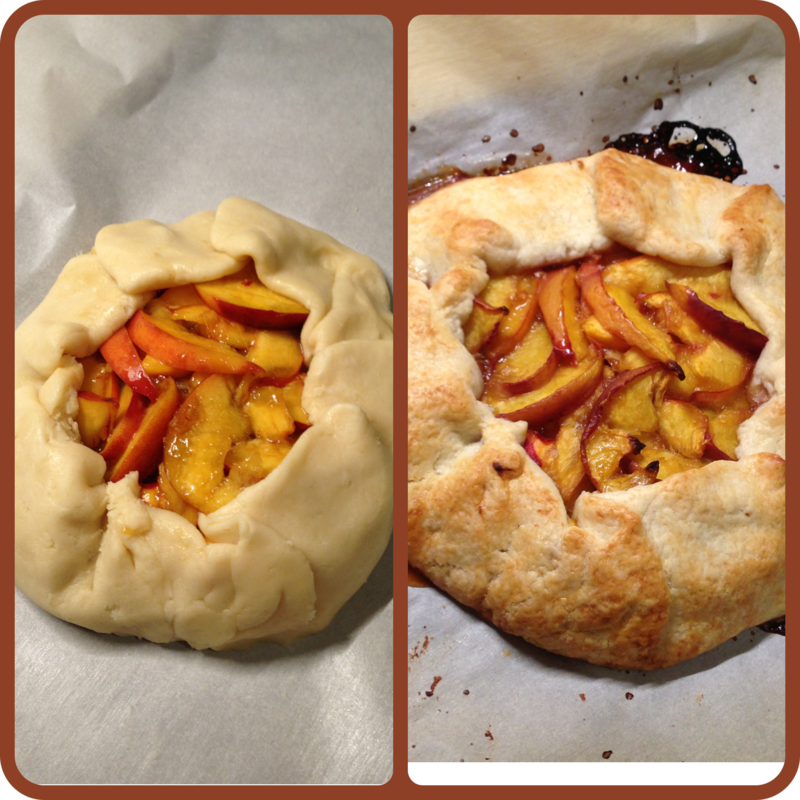 Peaches are LONG gone, but I saw this picture in some old iPhone photos and thought I would post the recipe, since (A) It’s one of our favorite go-to desserts, and (B) I wanted a galette. I still don’t have a galette, but at least now everyone else can know what I’m missing out on right now. “Any old pie crust” will not do. The crust is a crucial part of this dessert, partly because it needs to hold up structurally, but mainly because there’s not enough filling to “mask” over it. You will definitely taste it, so it needs to be good. Side note: Why even have a pie crust if it’s only going to be bland and possibly gross? Why not just have a bowl of pumpkin or baked apple filling and save everyone the trouble? A pie crust should be good. It should actually add to the flavor of the pie, not detract from it or have no taste. Even a simple crust with just a few ingredients can be delicious if it’s the right one for the pie. (If you have any more questions on My Food Philosophy 101, please see me after class.) But seriously. Crust. Don’t waste the carbs if it’s not good, man. I adapted this crust from a galette crust recipe in “Cast Iron Cooking,” by Dwayne Ridgaway. I actually don’t have a “recipe” for the filling and never measure, so this is just a guess on how much of everything to use. It should also tell you that this is a flexible recipe. Use whatever you have, and play around with it if you want. I would say the peaches and the sugar are the only required filling ingredients. And if “sugar” looks like honey or maple syrup to you, I say go for it (though keep in mind the filling will probably be more likely to ooze out of the galette with the liquid sweeteners). Use plastic dough blades if you have them. Toss in all the crust ingredients and pulse until it forms a ball. Mix the flour, sugar and salt in a bowl. Using a fork or a pastry cutter, “cut in” the butter until it looks like large crumbs. Basically, this means mashing the butter until it becomes a million tiny pieces and is evenly distributed in the flour. Add the ice water and mix with a fork until it forms a ball. Roll out the dough into a big circle (maybe 8-10 inches) on a baking sheet lined with parchment paper. The baking sheet must have edges, because the galette will likely leak a bit, and you do not want to chisel a hardened layer of burned fruit syrup off the bottom of your oven. Slice the peaches thinly and toss into a bowl with the remaining ingredients. It should not be as wet or gooey as a typical pie filling. Dump the filling into the center of the circle and fold up the edges toward the center, leaving a large “hole” (see the top photo on the left). Brush the milk over the folded crust for a simple glaze. We also love apple galettes and berry galettes, depending on the season. For apple, thinly slice an apple (or two, depending on the size) and mix with some brown sugar, cinnamon and a dash of ground nutmeg or cloves. For berry, mix with some white sugar and about 1/2 teaspoon of lemon juice. Berries are very juicy, so I would avoid using more than 1 cup of berries for the filling.